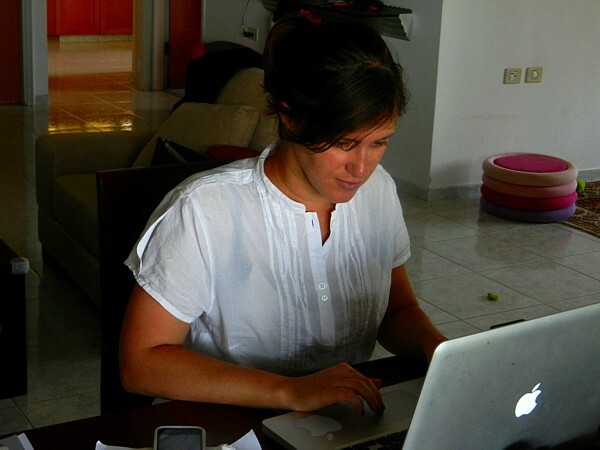 Linda Paganelli is a visual anthropologist and a film maker from the seaside town of Rimini (Italy). Since 2011, together with photographer Silvia Boarini and lately SMK video factory, Linda has been involved in the making of a documentary film about a group of Bedouins in the Negev desert in Israel. This post presents an interview with Linda about this film. Sunil: Linda, tell me about this film you are making. 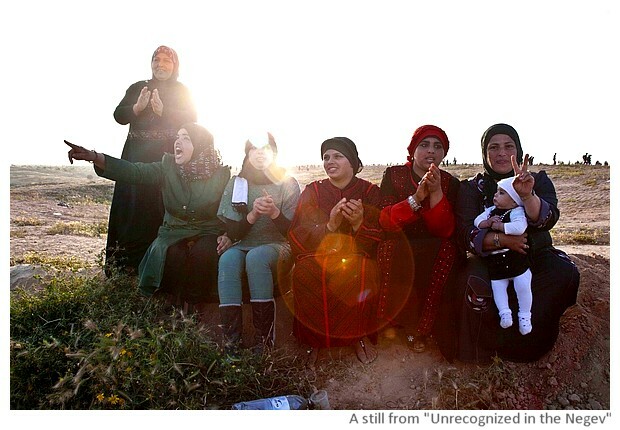 Linda: It's title is "Unrecognized in the Negev" and it is about a group of Bedouins from the village of Al Araqib. There are 38 Bedouin villages in the Negev desert in south of Israel, that are not recognized by the Israeli government. Thus, they are facing demolitions and do not have access to basic services like drinking water, electricity, and health care. The government calls them "invaders" though their villages go back to before the time of the Ottoman Empire. Sunil: Your film is about one village. How many persons live there? Linda: The first big demolition of that village was in 2010 when 35 families, about 250-300 persons, lived there. Since then there have been 67 more demolitions and now there are only 4 families left (20 people), though their homes have been bulldozed. So now they have been authorized to live only in the graveyard. They had become sedentary by the turn of the 20th century, while before they were semi-nomads. This meant that for certain periods of the year, they went away to find pastures for their animals but for the rest of the year, they lived in their ancestral villages. They have roots in those villages and they do not change them. Sunil: That sounds like some of the semi-nomad groups that I had known in Mongolia. Are the Bedouins culturally different from the Palestinians? Linda: The Bedouins are a Palestinian-Muslim minority in Israel, half of them are completely urbanized and the other half are living in unrecognized villages trying to keep their lifestyle and fighting against the state coercion. Palestinians in the West Bank and Gaza are under occupation, while Bedouins in the unrecognized villages are under demolition orders, as they do not fit in the State's ideal model of life and their villages are being designed for other purposes - in the case of Al Araqib, for making a forest. Sunil: I knew about the Israel and Palestine issues but I did not know that there were problems between Israel and the Bedouins. How are Bedouin issues different from the Palestine issues? Linda: In the war of 1948 when Israel annexed this area, most Bedouins escaped to other Arab countries or to West Bank or Gaza. Only about 11,000 Bedouins were left here and they became Israeli citizens. They have I.D. cards that recognize them as Israeli, however, they are not considered equal to other Israeli citizens. Sunil: How did you decide to make a film on this issue? Linda: In summer 2011, I met a photographer, Silvia Boarini, in Ramallah (West Bank, Palestine), who had been visiting the Bedouin villages since 2008. We did some work together and she asked me to accompany her to Negev to visit this village. We went back there many times and gradually we could build the trust between us and the villagers, by staying with them and listening to their problems. This film came from this experience. It has been very rich and humane experience. They wish to share their story with the rest of the world and make people aware about what is happening in the Negev right now. That’s why this is a story that really matters, we hope to enrich and inform many people through this documentary. Now the filming is done and the post-production work is being carried out by SMK Video-Factory in Bologna. Sunil: Thanks Linda for sharing about your film, best of luck for its success. Note: You can watch a small clip from the Bedouin village in the Negev on Vimeo. Linda and Silvia are also looking for support to complete the film - you can also contribute through Indiegogo. Relationships between Israel and different groups of Arabs - Palestinians and Bedouins, is so complicated with different levels of human rights violations that Israel justifies by security concerns.